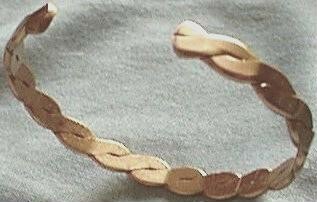 Serpentine Style Twist Copper Bracelet. Copper is in Style. It's Also Believed that it Helps in Soothing or Preventing Arthritis Pain. Made with Heavy Gauge Copper, This Bracelet is 1/8" Thick, 1/4" Deep, 2 1/8" High and 2 1/2" Wide. It Can be Opened to Almost 2 3/4". To Fit Larger Wrists. Style and Comfort Should Be Known! Items Shipped to Residents of Our Operating State(s) are Subject to Sales Tax. We Also Accept PayPal. See Instructions on Check Out.